Do you get excited every November for the great deals that retailers offer? The Black Friday and Cyber Monday craze continues to grow with extended specials that last much more than 24-hours. At Games For Fun, in San Bernardino, gamers can take advantage of discount pricing throughout the holiday weekend – that is of course, if they aren’t weary from their busy shopping extravaganza at nearby Ontario Mills. The holiday season is a perfect time to buy pool tables, air hockey tables, pinball machines, shuffleboard, jukeboxes, and of course ping pong tables for the home. From November 23rd through November 26th, Games For Fun is offering 10% off everything in store and online, and for in-store purchases, buyers can enjoy 6 months same as cash financing for orders $500 and up with approved credit. Since these game tables are fairly large, consider how you will be able to move your table around if needed. If you are tight on space, your table should be easy to maneuver. Aside from our JOOLA Professional Table, which is the perfect sturdy and beautiful table to stay ready for action year-round, all of our ping pong tables have the ability to fold upwards for compact storage and contain wheels for smooth transportability. Looking for something even more portable? Skip the legs, and just get the table top! 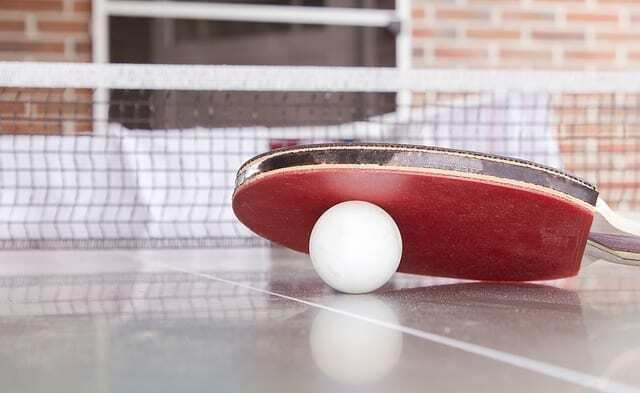 Our JOOLA Conversion Table Tennis Top is perfect to place on top on tables such as your pool table, so you can play easily without taking up more space in your home. Where is it going to stay? The most important thing to consider before buying your ping pong table is where you will have it in your home. Since table tennis can be played inside a room or out in the backyard, sizes and styles will vary. If you are planning on keeping your table inside your garage or game room, you’ll want to have a smaller style that won’t overcrowd your area. The sleek design and size of our JOOLA Tour 1500 Indoor Table Tennis Table are created to integrate into your home seamlessly. This 9×5 foot piece fits perfectly in any space while still allowing room to play. Keeping your table outdoors is a little different, as outdoor tables require weatherproof material. In order to keep your table in the best shape, your outdoor table will need to have a thick surface that can withstand weather changes. Our Kettler Outdoor Table Tennis Table is made of sealed aluminum with climate control material to last many years of sunshine and rain. Considering all of the elements within choosing your ping pong table is essential because this piece is meant to last for many years. Like any high-quality item, the better you take care of it, the longer it will last. Take notice of the leveling of the table top and the sturdiness its legs, as this will determine the durability. After time, you will notice your table has aged when the bounce is not as consistent. Especially if your table is kept outside, the top can get warped and lose its shape. Keeping a cover on your table is essential for daily care. Every ping pong table that is purchased with us has a 5-year warranty to ensure you are getting the quality deserved. Ready to choose your favorite table? Purchase during our Black Friday sale and receive a free table cover and accessory set! Plus, we will ship all of your items at no extra charge. Shop online or stop by our showroom in San Bernardino for storewide discounts. We are right off of the 215 freeway, conveniently located in the Inland Empire and accessibly by many Riverside and San Bernardino communities like Rialto, Colton, Fontana, Moreno Valley, Redlands, Chino, Ontario, and just a short drive from Orange County and Los Angeles County. Have a question? Reach out to us here and we will answer you quickly.